Harrisonburg, VA firm Yancey & Bowman, LLC, is pleased to announce the joining of their firm with Brown, Edwards & Company, LLP effective December 1, 2018. With this union, Roanoke, VA based Brown Edwards will have over 350 associates in 10 offices located in Blacksburg, Bristol, Harrisonburg, Lynchburg, Newport News, Roanoke, and Wytheville, Virginia; Charleston and Bluefield, West Virginia; and Kingsport, Tennessee. The partners and staff of YB will join the existing Brown Edwards office in Harrisonburg. With these changes, their clients can be assured they will continue to work with experts they know and trust and the transition will be seamless. “Over the years, YB has developed and grown valuable and well respected specializations that fit with our mission to provide a wide variety of services to our clients. The additional resources of Brown Edwards will allow the merged firms to deliver these services to an expanded market. And, importantly, we are adding well respected partners and staff whom we have known and worked with over many years in the Harrisonburg area. All of us have a similar approach to helping our clients achieve their goals and this merger will enhance our ability to deliver on our commitment to our clients," says Jason Hartman, Brown Edwards’ Chief Executive Officer. 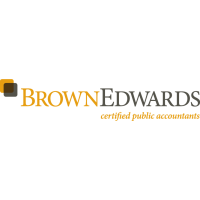 Recognized as a Top 100 public accounting firm in the country, Brown Edwards provides assurance, tax and business advisory services to a diverse clientele throughout Virginia, West Virginia, Tennessee and North Carolina.